The writer of ‘Jack of Fables,’ ‘Everafter’ and more discusses her work on an original graphic novel based on BOOM! Studios’ popular title. 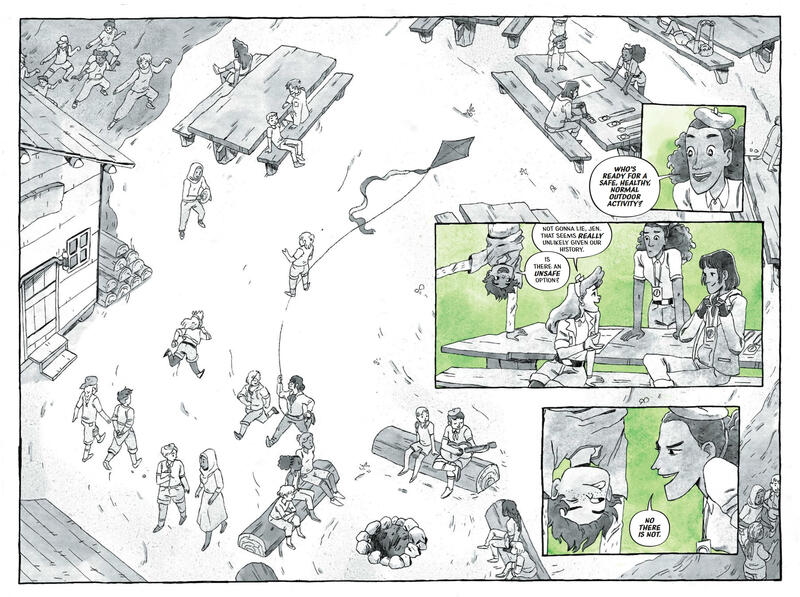 Lilah Sturges has been writing comics for more than a decade. People may remember her long runs co-writing Jack of Fables and writing House of Mystery. At DC she worked on Blue Beetle, Justice Society of America and many other titles. More recently she’s written Fables: The Wolf Among Us, Muirwood, Everafter and other comics. She’s also the author of the novels Midwinter and The Office of Shadow and has written the graphic novel The Magicians: Alice’s Story, which has been announced and will be released next year. 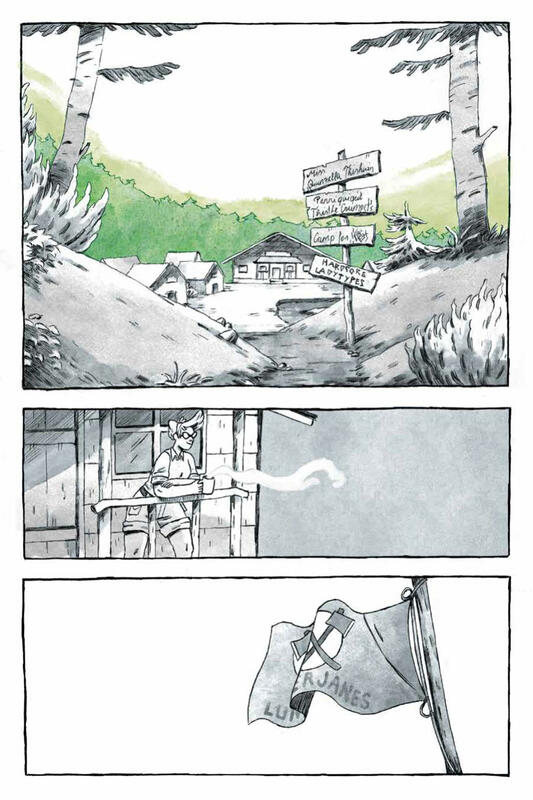 Her new project is Lumberjanes: The Infernal Compass, an original graphic novel that she wrote and is illustrated by the Austrian artist Polterink. The standalone story is centered around an orienteering activity, a cursed compass, and Mal and Molly’s relationship. The story has a member of Her Majesty’s Club for Lady Explorers, Adventurers, and Other Die-Hard Womanly Sorts, fully articulated gear-driven, flywheel-powered service automatons (not robots) and more craziness, but it’s the relationship between Molly and Mal and in particular Molly’s fears over being alone and that her relationship might destroy her friendships is what gives the book its emotional weight. Sturges was kind enough to chat about the book and her work. How did you end up writing Lumberjanes? I got a call about a year and a half ago out of the blue by an editor at BOOM! to write a different comic. I started working on that book – The Magicians graphic novel that’s coming out next year – and I guess my editor was bragging about how good it was and so a different editor at BOOM! said, “Let me see the script.” I guess she liked it, because I got a call from her asking me if I would be interested in writing Lumberjanes. Of course I was thrilled because I’m a huge Lumberjanes fan, so I said yes right away and the rest is history. Prior to writing this, what was your experience as far as scouting and orienteering? Orienteering works because it’s a weird compass related activity involving wandering in the woods. It is. It’s also weirdly Scandinavian, so it’s got that angle to it. I wanted to do something that felt sporty but also Euro chic and not just archery or whatever. I wanted to do something a tad different. When they called and asked if you wanted to write Lumberjanes, the idea was a standalone graphic novel, so you were thinking in those terms. Right. I was already in the midst of writing another graphic novel – an even longer one – and planning a third. I’ve been in a very graphic novel space lately and so how to structure a story like that, how to plan it and outline it and get it to come together, is something that has been a lot on my mind over the past year. That made it a lot easier to tackle this project because it’s how I’ve been thinking lately. It’s very freeing. Let’s say you’re writing a five issue arc for a comic book series. Each issue has to have its own story arc. Traditionally you want to end each issue with a cliffhanger or some kind of big twist. Being able to do it all as one big story makes it so much more organic and natural. Let the story pace itself rather than put any of these arbitrary moments. Although the one nice thing about a monthly comic is that when you’re working with a traditional 22 page comic structure, you get really good at writing 22 pages worth of story at a time. It’s a very digestible chunk of story that you can think about in your head as you’re writing. Whereas if you’re writing a one hundred page graphic novel it’s a lot more effort to keep the story in your head all at once. It requires a little more faith in your storytelling abilities, I think, than having the structure of writing it in pieces. You said that you have been a Lumberjanes fan so when you started were you thinking, “This is what I love about the series, this is what’s essential,” or how did you start? It was a very collaborative process. If you look at the list of creators, there’s four different people and that spirit of collaboration runs through everything Lumberjanes that happens. When I was coming up with this story I was doing it with my editor, Shannon Watters, who’s one of the creators of Lumberjanes. I had a seed of a story that I was given and I turned it into a story with my own take on it. It was very much a group effort. I can’t think of any story idea that wasn’t decided on communally. It was a very pleasurable experience doing it that way. 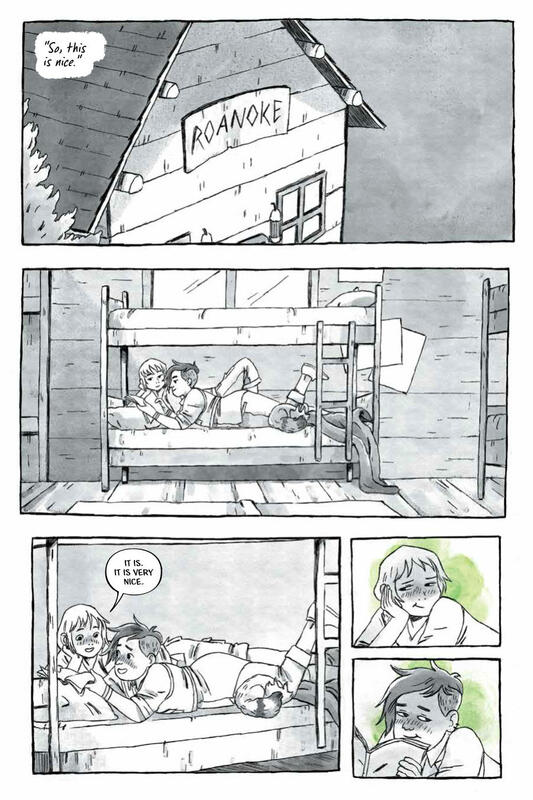 Mal and Molly’s relationship is at the center of the book and so it’s after the series has been going for a bit, but it’s unclear when exactly, and it doesn’t really matter. We all agreed that we wanted it to be a story about this new romance and how it was going to affect and be affected by their friend group. I think that’s a story that’s really relevant to a lot of younger readers. We start to have these feelings for other people and there are relationships involved but we don’t know how to manage them. We don’t even have the words for a lot of the things that we’re feeling. That sense of vulnerability was something we wanted to capture in the story. Having Mal and Molly being in the flush of this new relationship seemed like a perfect way to go about that. [laughs] When I wrote that line I was like, I’m done for the day! I’m not going to come up with anything more clever than that today. You were talking about how making the book was a very collaborative process. At what stage did Polterink come on board and what was it like working with her? Claudia came in fairly early. She had been selected as the artist even before I was selected as the writer. I was writing to what I believed her style to be. I saw her pages coming in as I was completing the book and that affected how I kept writing. She really just grasped exactly what the story needed to be and needed no hand holding at all. She grokked it from the get go. I’ve had situations where I’ve worked with an artist who just didn’t get the story or just didn’t care and was phoning it in. It was clear that Claudia was not only trying to do the absolute best for the story but trying to push herself to do something different and unique. I think that really comes out in the finished book. You said that by end, you were writing for her specifically. Is there anything you can point to? If you look at the very first page of the book, it’s silent, and she added that on her own. She said, “I really want to open it this way and how do you feel about that?” We worked together to have it be the thing that she wanted. What really impressed me about her from the beginning was how beautifully she drew nature and how lovingly she depicted it. By the time you get to the end where as Molly and the villain Lady Nibley are talking, they’re going through all of these different environments – they’re walking on a cliff and they’re crossing a stream. This was me wanting Claudia to draw all of these things. What else are you working on right now? You mentioned The Magicians book earlier. It was announced last month that I’m doing a graphic novel, The Magicians: Alice’s Story, which is a retelling of Lev Grossman’s novel The Magicians from the point of view of Alice. When I originally got the call from BOOM! to do that book, I said I didn’t want to do a straight adaptation, I wanted to do something different. I went back and reread The Magicians and I saw that Alice was a really fascinating character. I thought, I want to write the book about her. I said I want to write it from her perspective and they were supportive of doing something different and weird. It’s come out wonderfully and the art is phenomenal. That comes out in July of next year. I’ve also have a creator-owned graphic novel that’s being drawn right now by Megan Carter for another publisher that hopefully will come out in the next couple years. That’s a very personal one. It’s a transgender coming of age story set in a fantasy world. I’m very excited about that book. That won’t be announced for a while yet. 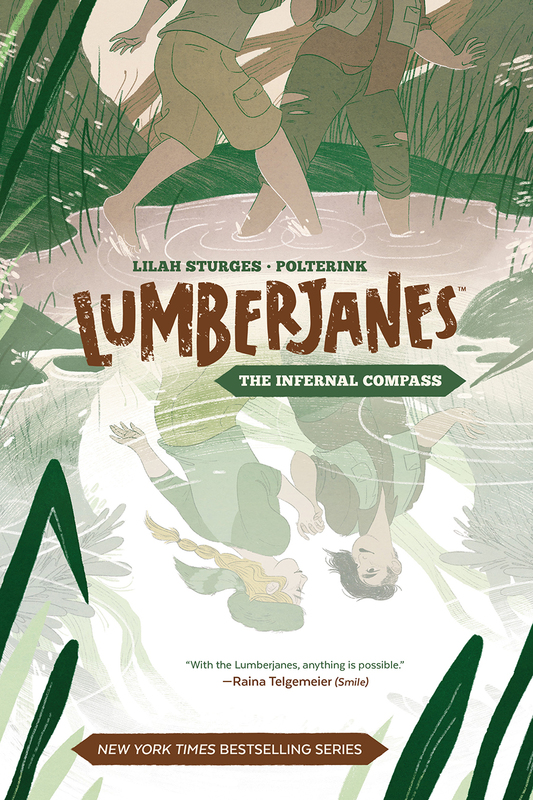 Last question, when people ask, how do you describe Lumberjanes: The Infernal Compass to people? I try to lead off with what Lumberjanes is all about because the idea of Lumberjanes is so beautiful and essential and needed. Lumberjanes is a book that is set in a world where sexism and homophobia and things like that don’t matter. 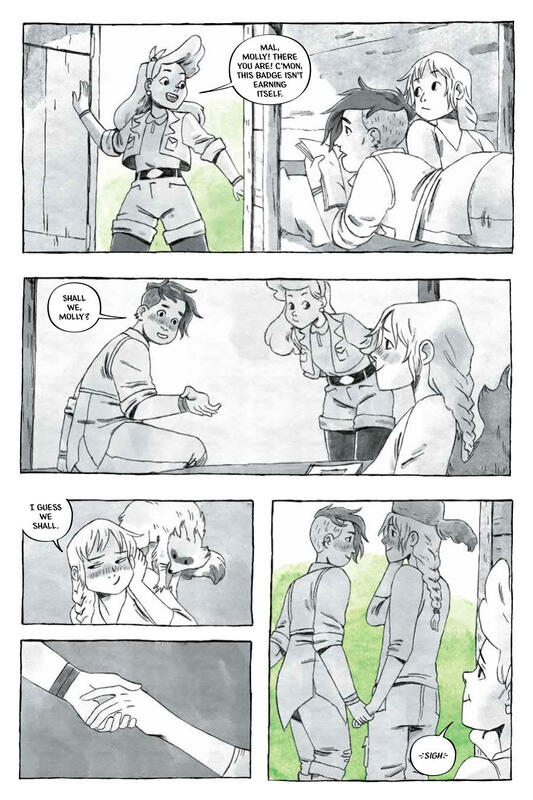 It’s a beautifully girl-friendly, queer-friendly space where conflict never has to do with these characters undermining each other. There’s always a conflict that’s out in the world that has to do with how the girls are feeling and how they need to learn to be better people. The stories are never about the girls backstabbing each other or being catty towards each other or being nasty to each other. It’s a really beautiful vision of what storytelling can be for all ages because it doesn’t require nastiness in order to tell a great story. When you read a Lumberjanes book it should always make you feel really good and that’s what I tried to do with Infernal Compass. Here the villain is a wayward woman from the Lady Explorers’ Club who’s been searching for this cursed compass. The curse is that it leads people astray form what they ought to be doing. When Molly gets her hands on it it leads her away from her friends. Which is the basis of all her fears, that she’s going to be left alone. How Molly and Lady Nibley, the explorer, work together – or don’t – in order to find themselves is what the story is all about.